Seeing a space ship catapult on its way to the great beyond on television gives us this visual of fire and lift off. Seeing the rocket engines that provide the thrust to push a rocket into space is an amazing opportunity. 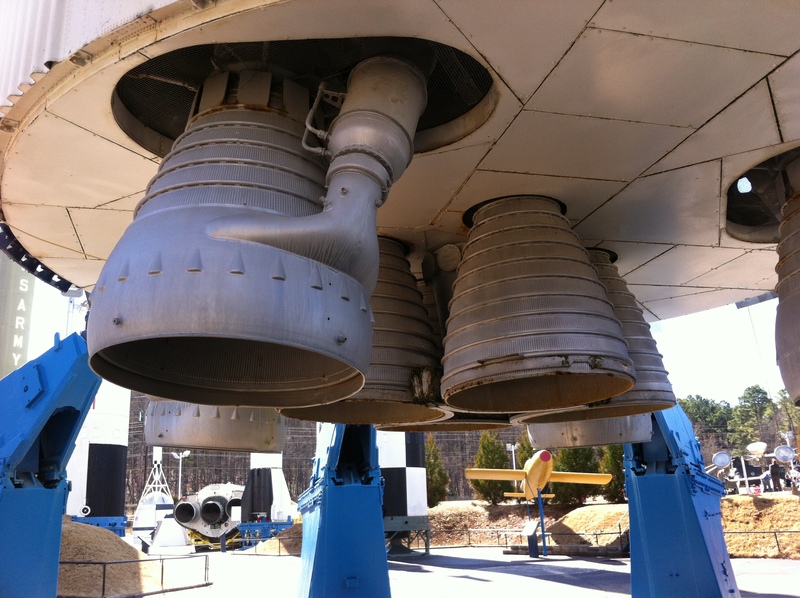 We saw these engines along with rockets and rocket models and learned a little about the race to space during a tour of the U.S. Space & Rocket Center in Huntsville, Alabama. Learning that it was former German rocket scientist that surrendered to the Americans was something I had missed in my space history. I admit to blanking out a bit as a kid when we discussed the race to the moon, but who wasn’t fascinated and transfixed by the pictures of the men in white space suits floating on the moon’s surface. History was made that day and we have been surging forward every day since then in a big part thanks to Wernher von Braun who eventually became a US citizen and created a big part of the Apollo technical aspects. The center is a great place to go and get your space history fix. I know my husband wasn’t there near long enough to get all the details. He plans to go back and immerse himself in rocket 101!